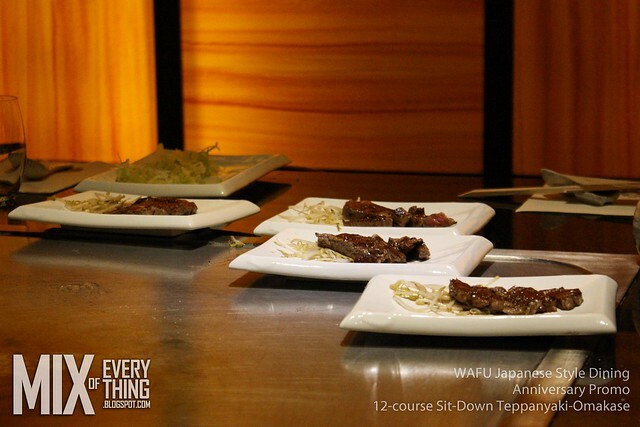 WAFU's 12 course Teppanyaki Omakase Buffet. - Hello! Welcome to my blog! Took me a while to post this one right here but it's not too late! 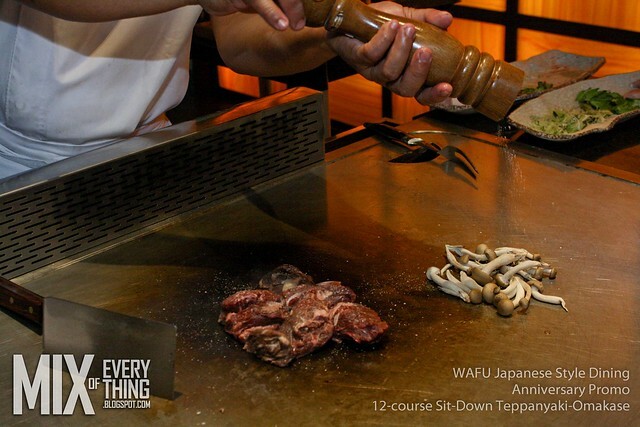 WAFU, one of the newest modern Japanese Dining resto in the metro has just celebrated its first year and they are celebrating it by giving us a taste of of what their 12 course Teppanyaki Omakase is about! 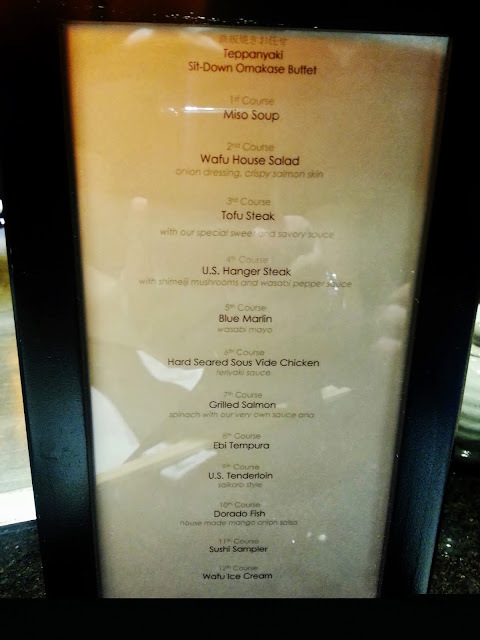 Basically, the idea is you have to go throught the 12 course buffet. If you finish it and you want more, you can go through it again. Just advise the chef. 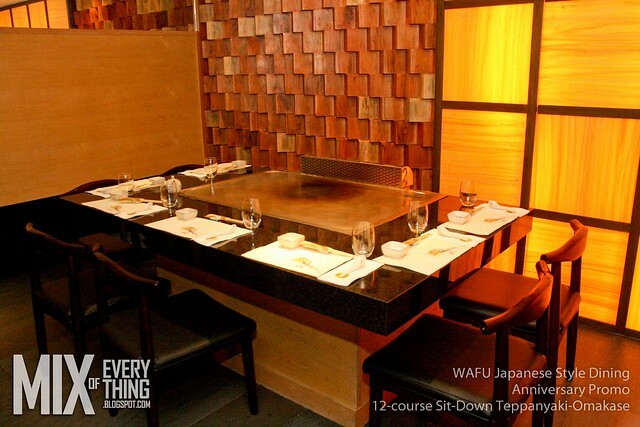 WAFU's Teppanyaki is located at the 2nd floor of this really nice Japanese restaurant. 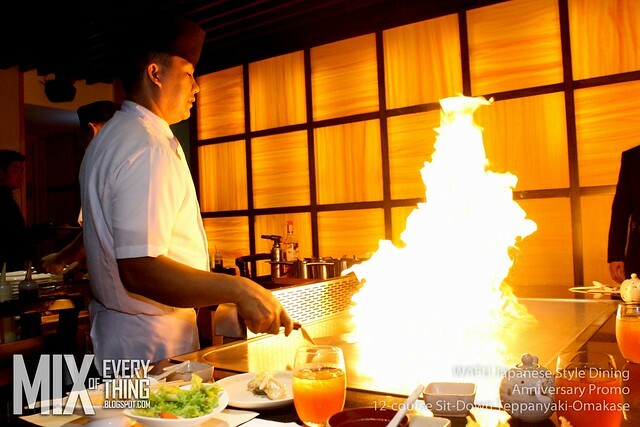 They have around 4 Teppanyaki tables and 1 Teppan private room. 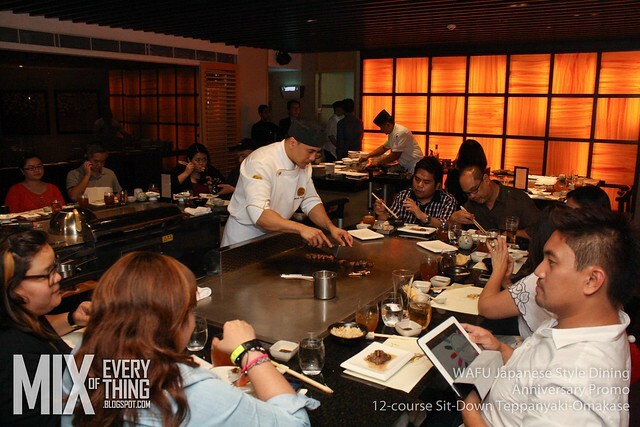 Original cost of their Teppanyaki Sit-Down Omakase Buffet is P1,800/head + service charge. 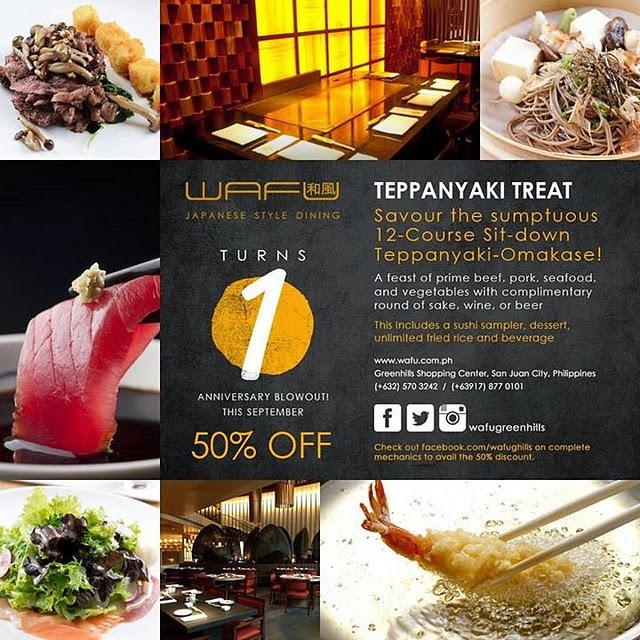 But right now until December WAFU is also slashing 50% the price as part of their anniversary blowout. Anyways, on to the menu. If I remember correctly, it wasn't served as warm as I hoped it would be. 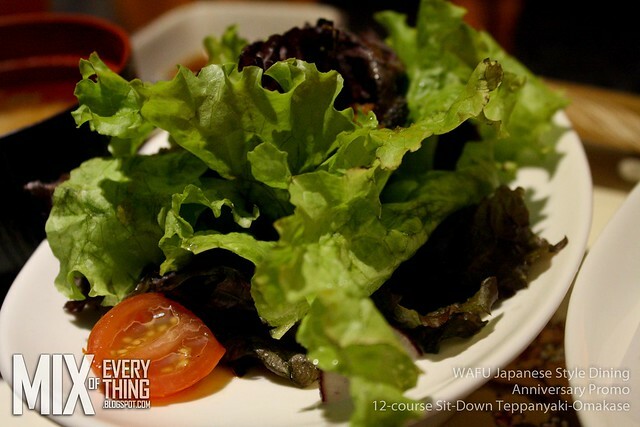 Tomatoes and some greens with a really nice oinion dressing. I don't eat green as often as I'd want to, but this one was just ok.
3rd. 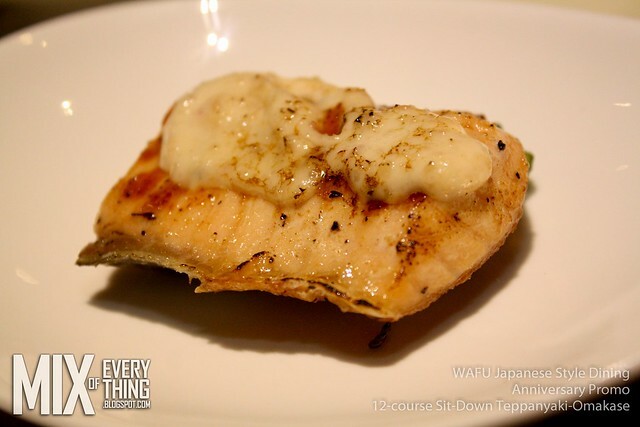 Tofu Steak.The sauce which was sweet added a nice touch on the seared tofu. Now we're getting somewhere. Some Meat! 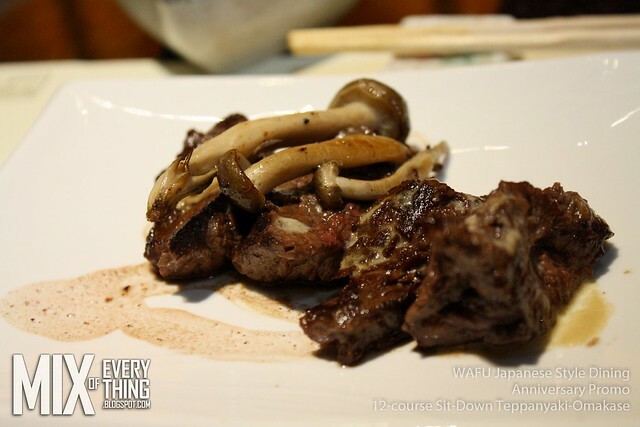 The U.S. Hanger Steak had some shimeiji mushrooms and wasabi pepper sauce. 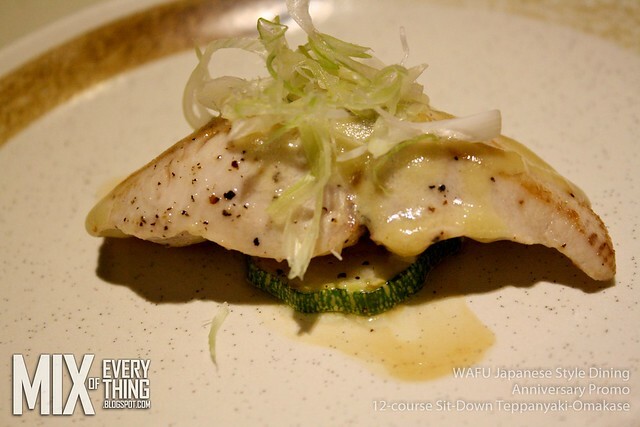 Fish would not be my first choice but this one has wasabi mayo in it and it was really good! Rice was also served by the way. It was sweet and just right. Half way done and I felt that no one can stop me. Bring it on my tummy says. On the the 7th! 7th. Grilled Salmon. It has some spinach and their very own sauce. It was really good. This was probably a nice breaker which is not cooked on the table.Something indulging and good. 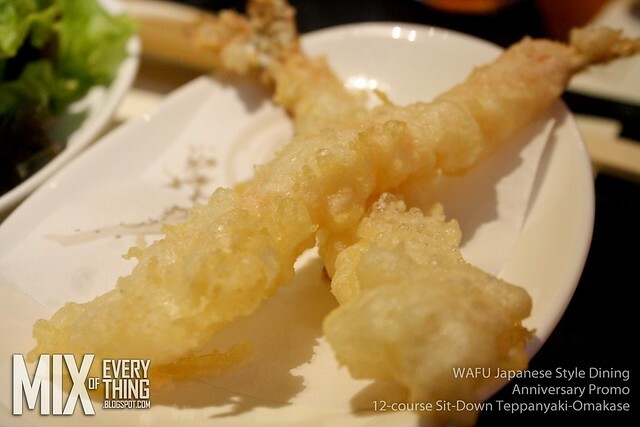 You can't go wrong with Ebi Tempura. Not sure why I wasn't able to take a better photo of the Tenderloin. Maybe I ate it too quickly? Not so sure. 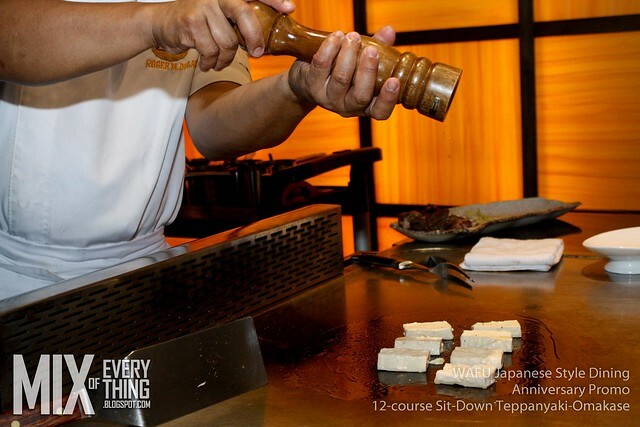 Quality was just superb and feel free to tell the chef how you want it to be cooked. 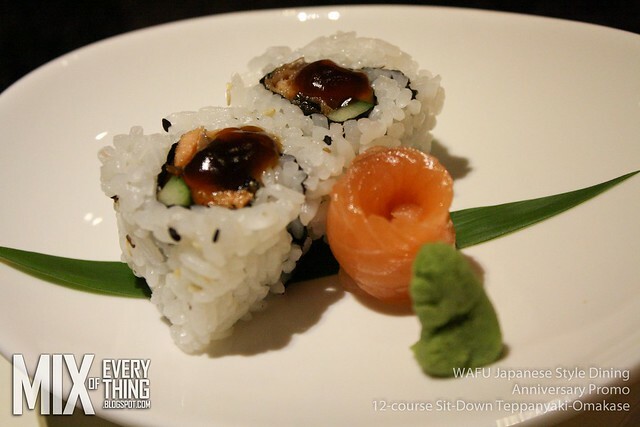 The sushi sampler varies. 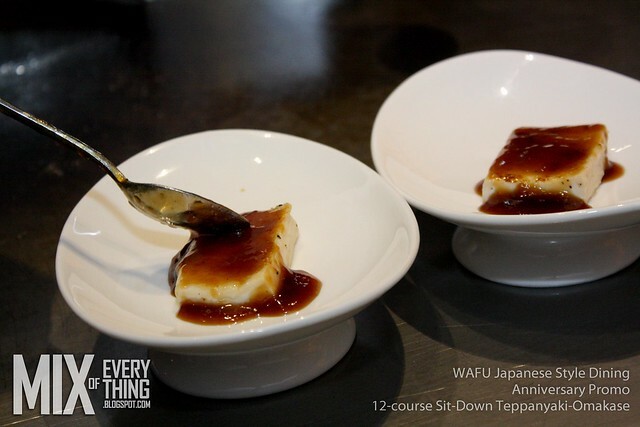 The one that was served had a nice presentation and was just right to semi end the 12 course. 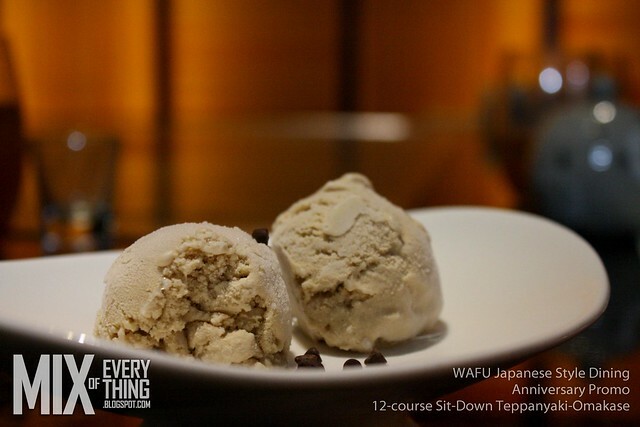 Who wouldn't love to have coffee ice cream after going through all that right? Well if you're not full after all this then feel free to go another round. So! 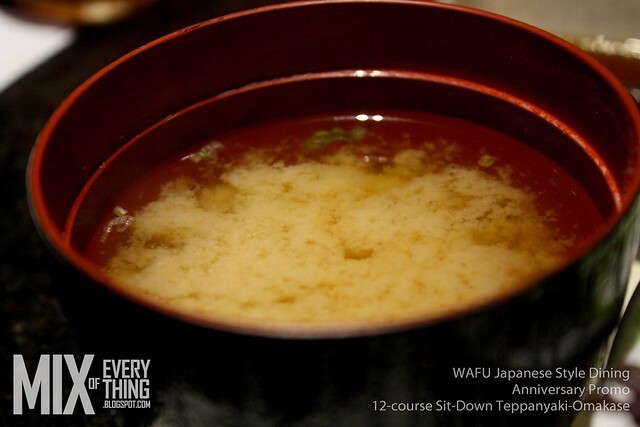 if your planning to have an awesome time with friends and family with great food. 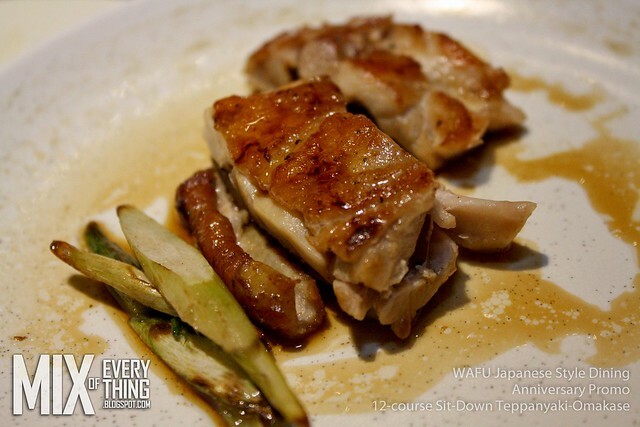 Head over at WAFU in Greenhills. 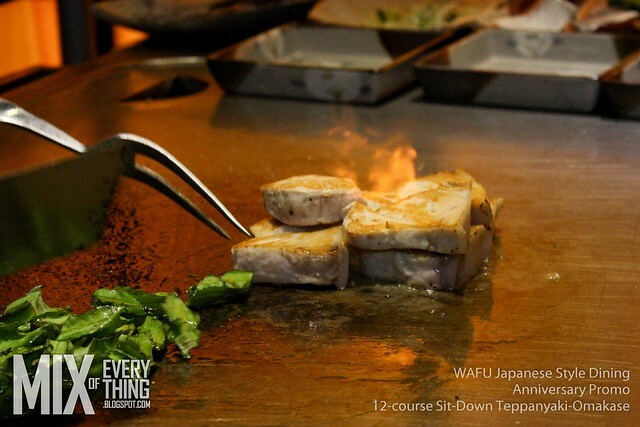 Be sure to call first and reserve in advance because they only have 5 teppan tables. 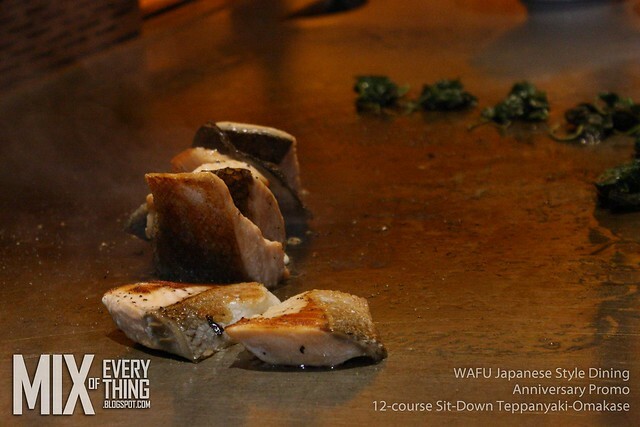 Things I liked on this WAFU Teppanyaki Omakase experience? -Theatrics. So interactive and I guess we just love a good show. 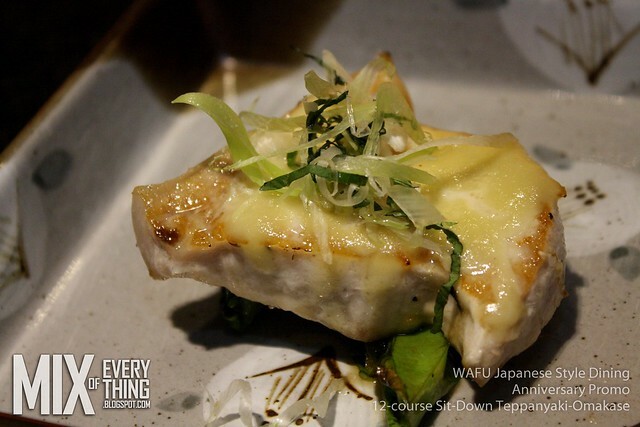 I think anyone would be amazed when Wafu's chefs do a bit of of exhibition. - Ingredients. 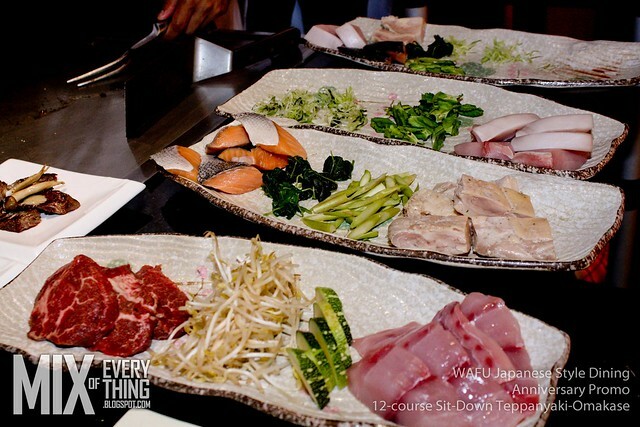 - Using the best and freshest ingredients. 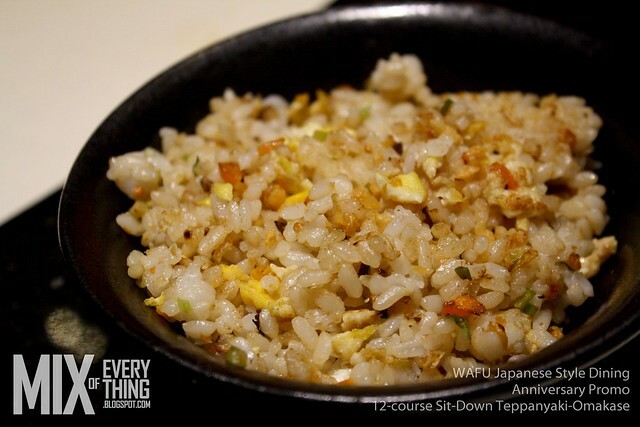 Wafu's teppan is just all goodness! - Ambiance. 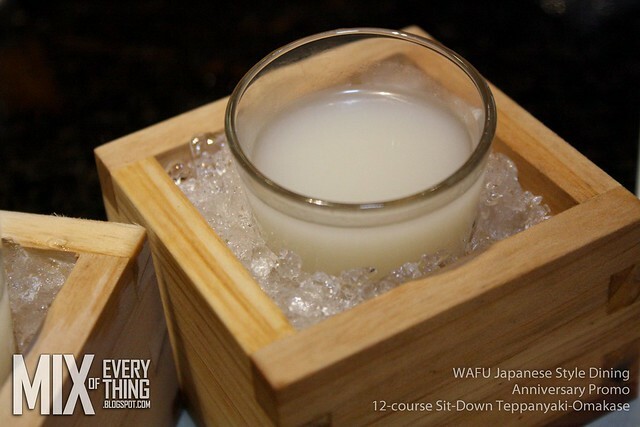 - The place is really nice and the overall experience was just great. 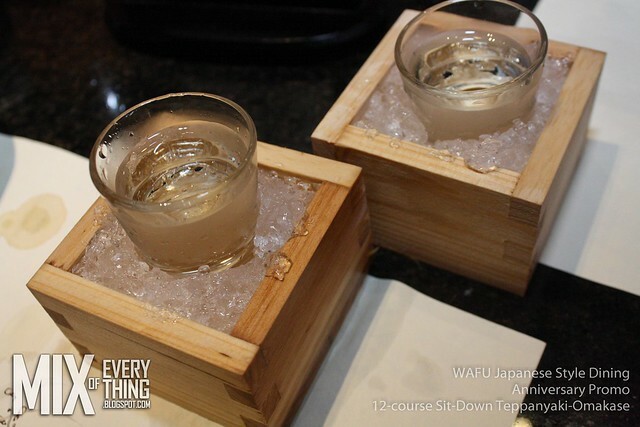 Perfect for small gathering or for special occasions. 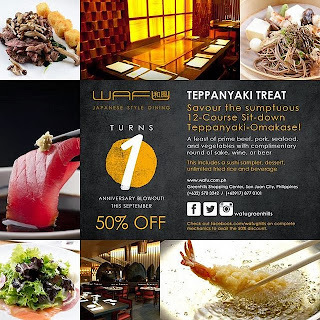 WAFU Japanese Style Dining is located at Greenhills Shopping Center at the New Gloria Maris Bldg. Tel. No. 570-3242, 570-3364. 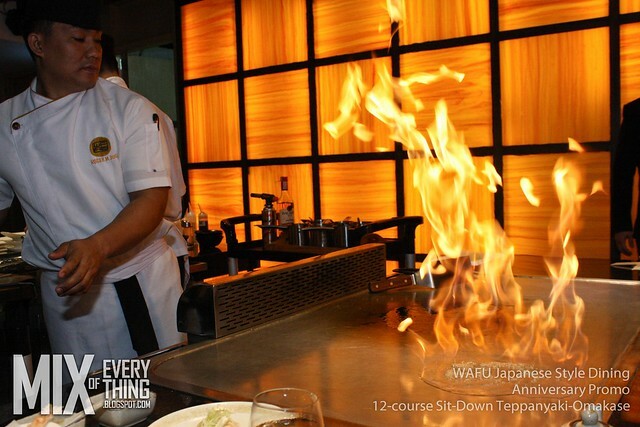 They operate 11am to 2pm for lunch and 6pm to 10pm for dinner. Open Monday to Sunday. Follow them on Facebook , Twitter and on Instagram. You may also email them at wafughills@gmail.com. 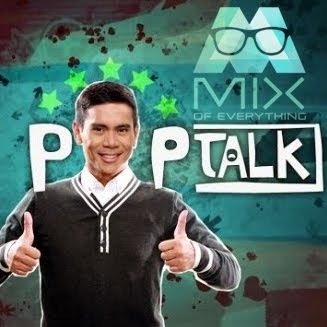 Check out this video feature.